Could a Little Poisoning Save a Life? In 1935, Australia was invaded. Since then, countless numbers have died, yet the intruders went unchecked for years. We even invited them in. And they’re still here. So why don’t we hear more about this? Well perhaps because the threat is not quite what you might be expecting. 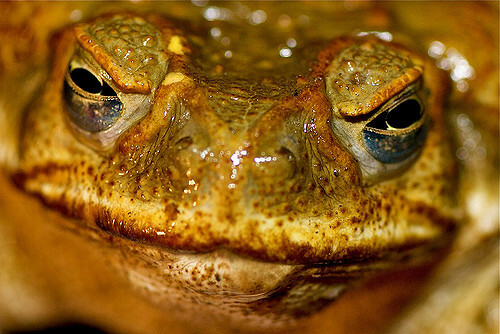 This invading force is in fact the humble cane toad, hailing from South and Central America. You’ve probably heard of them – small, yellowish, and no direct threat to us. But they’re very poisonous to the many animals which try to eat them, and might even lead to the extinction of many of our already-threatened native animals. So let’s go back to the start – how did we even end up with this problem? Well, many invasive species are transported between landmasses by accident, but cane toads were actually brought here deliberately to try to control cane beetles, which were a blight on the sugar cane industry in Australia. The toads were released in northern Queensland and spread fast, perhaps raising hopes that the beetles would soon be controlled. But it turned out that the instigators of this scheme were wrong, and the toads had no impact on the beetles. Much like how that The Simpsons episode and The Old Lady who Swallowed a Fly tell us, simply adding another new species doesn’t necessarily fix the problem of an old one. But in this case, it also had a huge impact on native animals. Hungry? Image credit: Pete Hill via Flickr. The problem is that Australian animals grew and evolved for thousands of years without exposure to animals like the cane toad. This means they’re not used to the poison that the toads contain, and they don’t realise they shouldn’t eat them. On the contrary, many are used to eating similar animals (even other toad species), so have no inhibition towards giving these ones a try. But the high poison content of the toads, mixed with a low tolerance level in the native animals, is a deadly combination. This means that even animals which have the ability to learn from their mistakes aren’t able to learn from this one – they’re more likely to die from their first try. Well unfortunately, even though the toads are bad news for native animals, the Australian environment seems to suit them pretty well. They’ve crossed into New South Wales, the Northern Territory, and even parts of Western Australia, and they’re moving further west at a rate of 40-60 km per year. It’d be pretty impressive if it weren’t so devastating. So what can we do about it? Many researchers are currently working on ways to stop the spread, but there might also be ways to reduce the toads’ impacts in the areas they’ve already reached. 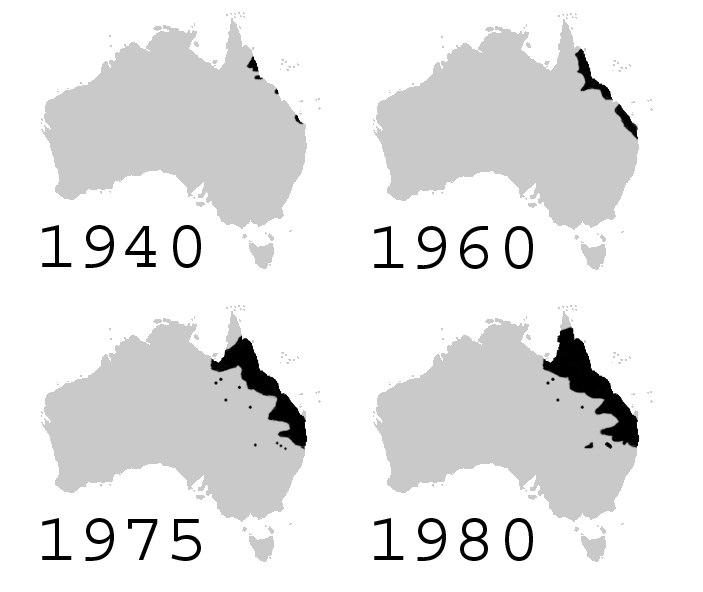 Cane toad spread up to 1980. And it’s only got worse since then. Image credit: Froggydarb via Wikimedia Commons. While some animals have managed to survive the influx of toads relatively well, others still need our help – and we might just have found a way to. Work has recently begun to protect the northern quoll, an iconic Australian native faced with death by toad. Quolls tend to hunt larger toads, so they’re hit with a higher dose of poison on their first meal and generally die before they get a chance to learn from the mistake. But – going back to my question in the heading of this blog – could poisoning also help to save them? Researchers have recently begun taking advantage of quolls’ learning ability to train them to avoid toads. By using toads covered with nausea-inducing chemicals, they’re helping quolls to associate bad experiences with toads. They’re essentially giving quolls a lower-dose poison so they’ll learn to avoid the toads in the future. This means that even if we can’t remove the toads as easily as we’d like, we can still help native species to survive. Invasive species are a problem worldwide, and the path to returning environments to their natural state is hard if not nearly impossible. But, while it’s still not an ideal situation, at least we’re finding some ways that we can improve animals’ chances of survival. And if any of this has inspired you to do something to help our environment, check out this site for 10 ways you can help plants and animals adapt to changing conditions! Next Next post: I’ve got you, under my skin: The science behind tattooing. Yes, it’s not the most pressing issue for conservation in southern Australia, but it’s definitely still important (especially as the toads are slowly moving South!). Hopefully some conservation campaigns may even be able to be adapted for similar problems around the world! Great to read a bit more about such a major problem for Australia. I feel that those of us that live down south forget how destructive they are. It reiterates again how sensitive eco-systems are and the enormous amount of effort that is required now to protect native animals and eradicate cane toads. Teaching the native animals to be wary of the toads is an interesting and creative solution! I hope that many more animals are able to learn like the quoll. I don’t even want to consider if they can’t… it’s too devastating if the toads win.